I know that only a small slice of my readers live in California, so I hope the rest of you will indulge me while I go through my periodic review of California ballot initiatives today. There are nine of them up for a vote next month, so this is going to be a bit of a long post. Marijuana Legalization: MAYBE. Let’s be honest: nobody needs my help with this one. If you’re in favor of legalizing pot, vote Yes. If not, vote No. I’m a little embarrassed to admit this, but I probably won’t make up my mind about Prop 19 until I’m actually in the voting booth and ready to push the button. that it sets its rules in stone and allows the legislature very little scope to change them if things don’t work out. And there’s no question that allowing every county in California to write its own marijuana laws could create a fair amount of chaos. What’s more, there’s also the fact that legalizing marijuana won’t just create more casual marijuana users, it will almost certainly also create more heavy users. That’s not a good thing. So there really are a few things to be careful about here. On the other hand marijuana is, overall, basically a pretty damn safe drug, and the dangers of increased use are modest enough that there’s really not much excuse for the state prohibiting grown men and women from using it if they want to. What’s more, a perfect legalization measure is unlikely to ever come along, and the California legislature won’t work up the stones to deal with this any time soon either. As initiatives go, this one isn’t bad. Redistricting Reform: YES. 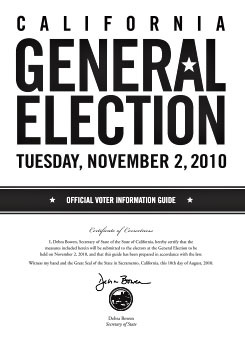 Two years ago we passed Proposition 11, which took redistricting of state districts out of the hands of the legislature and put it in the hands of a “citizen commission.” There were two modest downsides to this: (a) the way the commission was set up is a little bit squirrelly, and (b) there’s a lot of evidence that redistricting reform is unlikely to have a big effect. Still, I recommended a Yes vote on Prop 11 and I recommend extending it this year to congressional districts. Having legislatures draw their own boundaries is crazy, and we’ve passed up a bunch of opportunities in the past to fix this. This one isn’t bad — the “citizen commission” may be a little squirrelly but it’s not obviously biased in favor of either party — and even if it makes only a small difference, small is better than nothing. Park Surcharge: NO. This initiative increases the vehicle license fee by $18 and applies the revenue to maintaining state parks. It’s a hard one to vote against since it’s fully self-funding and fiscally defensible, but we just can’t keep doing stuff like this. Every year we pass ever more initiatives that set up special funds or earmark revenue for special purposes or demand that the legislature allocate spending in a certain way. Then we complain that the budget is a mess. We really have to stop doing this, even in a good cause. Prohibit State Raids of Local Funds: NO. This one is a little hard to vote against too. It’s yet another long-term domino effect of Proposition 13, which not only lowered property taxes but essentially made Sacramento the final arbiter of how to allocate them. As a result, sometimes the state allocates money in ways that local communities resent, like giving more money to schools or using transportation money to pay off state transportation bonds. I sympathize. But you know what? Them’s the breaks. Voters wanted lower property taxes in 1978, and one of the results is that local communities lost a big chunk of their funding and gave up a lot of fiscal control to Sacramento. I think that was a bad trade, but if voters ever decide to agree with me the answer is a full-scale overhaul of Prop 13, not constant piecemeal attempts to tie the legislature’s hands and continue our collective fantasy that tax cuts have no consequences. Eliminate Greenhouse Gas Limits: NO. This is a no-brainer. The legislature passed AB 32, the Global Warming Act, four years ago, and it mandates a range of measure to cut greenhouse gases and encourage the use of renewable energy sources. It’s extremely popular, as it should be, except with a few big oil refiners who are trying to buy themselves an initiative that would, in practice, repeal it forever. It’s a bad idea. Repeal Business Tax Cut: NO. Another tough vote. These tax cuts were unnecessary, we can’t afford them, and they were passed only as part of horsetrading with Republicans in order to enact a budget a couple of years ago. But look: ugly or not, these are the kinds of deals legislatures need to be able to make. But I’d be lying if I didn’t admit that I might vote Yes once I actually get into the privacy of the voting booth. Special interest tax cuts like these are pretty indefensible in a state with a $19 billion budget hole. Pass Budgets With a Simple Majority: YES. It is almost clinically insane that California requires a two-thirds vote to pass our annual budget. The whole point of a supermajority requirement is that it be reserved for only a few specific matters of special concern. The annual budget is the exact opposite of that. For good or ill, of course it should only require a simple majority. Require Two-Thirds Vote To Increase Local Fees: NO. Proposition 13 is most famous for lowering property taxes, but it also established a two-thirds vote requirement for future tax increases of any kind. But what about fees? Those can be raised with only a majority vote, and both the state and local communities often use fees to charge businesses for safety and cleanup programs — for example, levies on beverage containers to pay for recycling programs or fees for cleaning up oil spills and fighting air pollution. Needless to say, oil, tobacco, and alcohol companies don’t much care for this, and Prop 26 is their way to put a stop to it. But even if they have a point about the fuzzy boundary between taxes and fees, flatly eliminating the ability to charge corporations for the damage they incur goes too far. (I say “flatly eliminate” because in practice no fee increase can ever get a two-thirds vote and they know it.) The last thing we need is another initiative from rich special interests that effectively ropes off yet another budget area from legislative control. It’s madness. Eliminate Redistricting Reform: NO. This would undo redistricting reform completely. Obviously I’m against that.